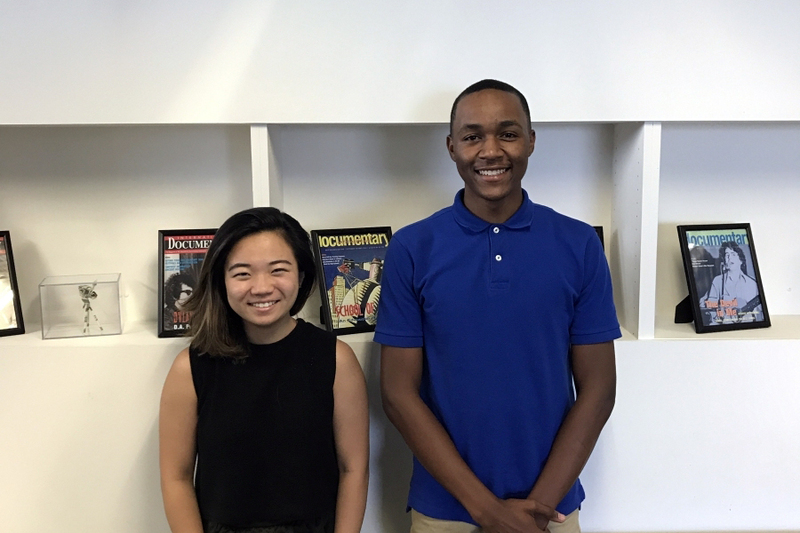 The IDA is proud to introduce the two immensely talented individuals who are serving the documentary community this summer through internships at IDA: Xavier Allison (Filmmaker Services Intern) and Cecilia Hua (Educational Programs Intern). Xavier and Cecilia's internships have been generously sponsored by the Los Angeles County Board of Supervisors through the Los Angeles County Arts Commission. Xavier, a rising senior studying business management at Fisk University in Nashville, is a Los Angeles native who has always loved the arts. As a teenager, he began making short films on his phone, and eventually started entering filmmaking competitions. In 11th grade, he presented an iPhone 4-shot film called "The Geisha and Samurai" at the NAACP ACT-SO Competition in Florida, and won the silver medal and a cash prize. His other extracurricular pursuit is horseback riding and show jumping, and he was a member of the Compton Junior Posse, where he practiced 3 times a week and showed once or twice a month during high school. This summer at IDA, he's working on an intensive research project, compiling information from 30 different grant organizations to better understand who they fund and how much they've contributed. "Among many other things, I enjoy the friendly and productive work environment at the IDA," Xavier says. "There is a warm energy at the IDA that makes me feel good about coming to work. I enjoy working with such dynamic leaders as Toni Bell and Amy Halpin who always show sincere appreciation for the work I do. I am also thankful for the networking opportunities that were made possible by the IDA." Cecilia, a recent graduate of USC, grew up in several cities, including Shanghai and Beijing, before moving to Portland, OR to attend high school. As a Cinema and Media Studies major, she focused largely on film studies, history, and theory. While on campus, she worked as a photojournalist for the student magazine, but soon realized that she didn't want to do pure journalism – and wanted to be creative in a more meaningful, lasting way. So she started making documentary films. She is interested in film as a way of understanding different cultures, and connecting viewers to marginalized groups. Her favorite filmmakers include Robert Bresson, Edward Yang, and Hou Hsiao-Hsien. In the realm of documentary, Cecilia says that Joshua Oppenheimer's The Act of Killing "had a very strong personal impact on me. It subtly became one important 'turning point' for me in college, raising important questions about cinema, filmmaking, documentary and also about identity, politics and international interventions." This summer at IDA, Cecilia is helping the education department prepare for its events, researching the participants beforehand to see what they might need for their presentations, working with videos of the events, and helping reorganize IDA's video library. The IDA and the L.A. County Arts Commission appreciate Xavier and Cecilia's service this summer. We have benefited greatly from their dedication, inventiveness, and kindness.